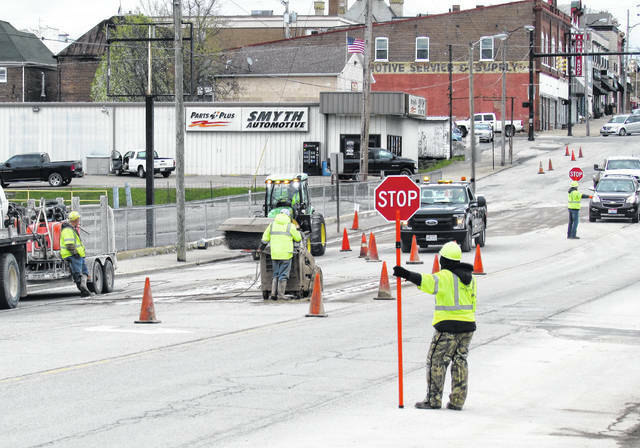 Traffic was stopped at times, but maintained Monday afternoon as workers from the Ohio Department of Transportation performed road repairs in the 200 block of West Main Street in Hillsboro. Gary Shannon, ODOT project inspector, described the work as “full deck repair” where workers sawed out defective parts of the roadway before using a back hoe to dig down past the older parts of the original brick road, which he estimated to be 16 inches or more. He said work should be completed by the end of the week.